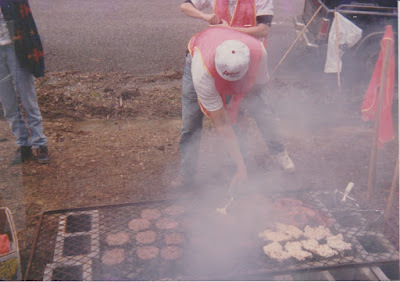 At the first cleanup we cooked hamburgers and chicken on a makeshift grill on the side of the road near the bridge. We started with 16 members including our children. The next year we had 32 members and the 3rd year it was many more. All together at one time we hosted around 200 members and volunteers. FoHC has removed literally tons of trash and debris over the years including appliances, cars, household garbage, and thousands of tires over time. We took 232 tires from one location is a single day. The work has been long and tiring but well worth the effort. It has always puzzled me how some people think the outdoors is the best place to dispose of unwanted items and garbage but it happens every day. 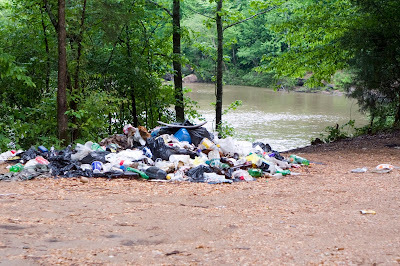 Without efforts like the FoHC Cleanup it would simply accumulate to a point of being not only unsightly but unhealthy and in some cases dangerous. 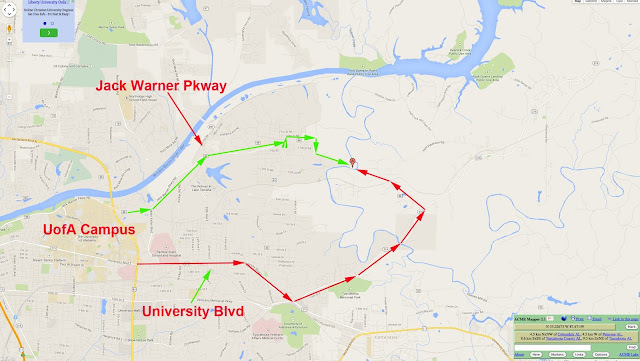 Localized flooding during heavy rain events is mostly caused by stopped up drains. Thanks to Rumsey for the can! When this much litter builds up it has no choice but to run into our drinking water watersheds. 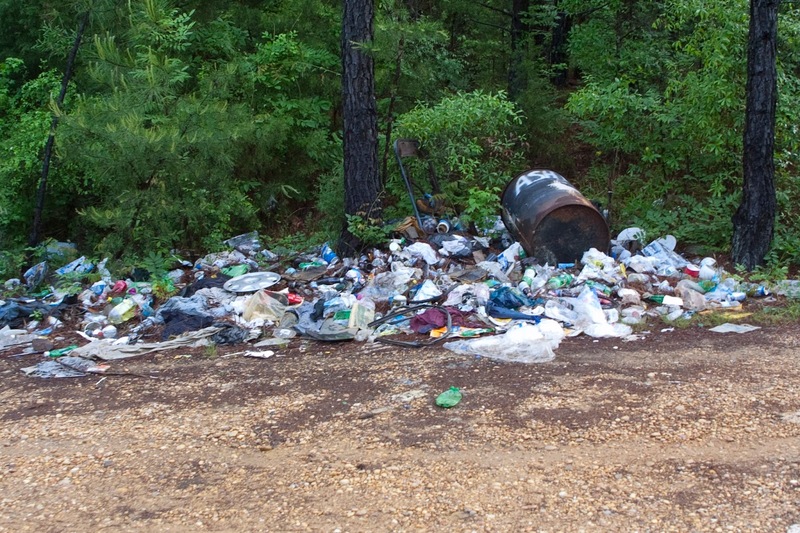 Cities all over America are spending millions of tax payer funds removing the bulk of litter before it reaches the water processing facilities. Millions more are spent removing it from local street and road drains. 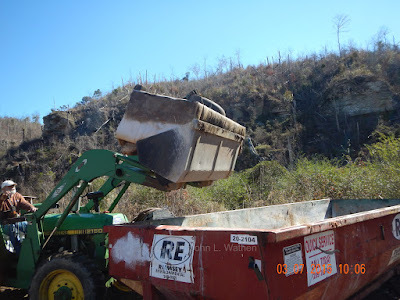 I'd like to think that over the years we have helped the community by removing tons of waste using local volunteers at a cost of "0" tax-payer dollars. Litter, after all was the catalyst for our group to begin 25 years ago. Unfortunately it is still a huge issue today. 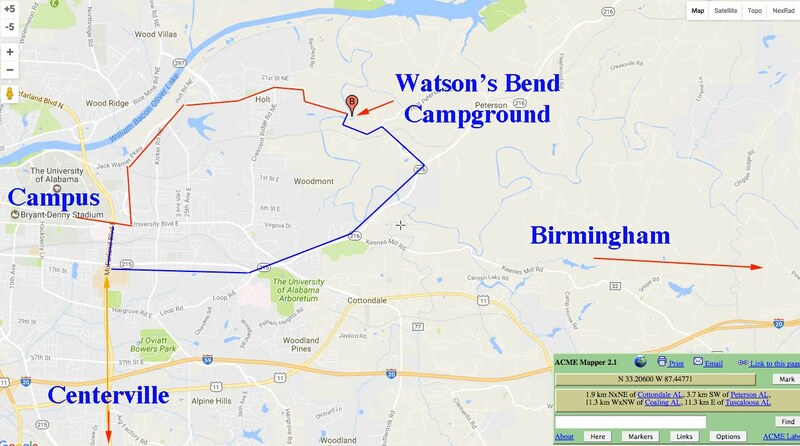 With that said, I'd like to invite the entire community to come out to Watson's Bend on Hurricane Creek and help us celebrate this monumental event. (see map below) This marks our 25th anniversary. We have the longest continuous running stream cleanup is Alabama History. 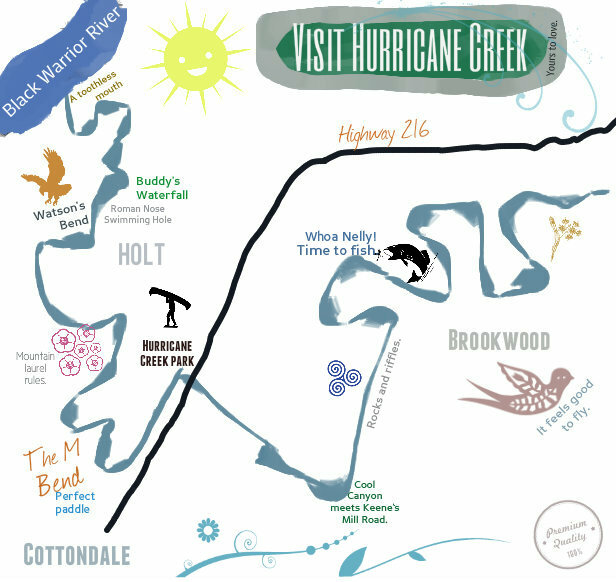 Come share your Hurricane Creek stories with us. 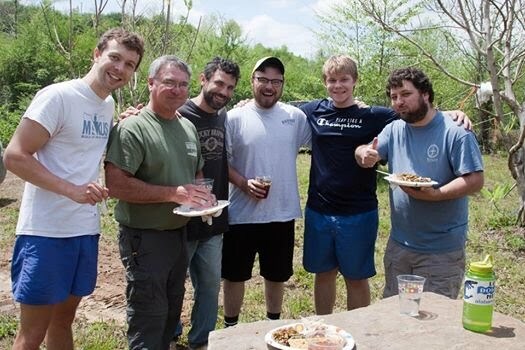 I'll be interviewing volunteers on camera for a video we are creating so come tell us what it is about the creek that makes it special for you. This year we are going back to an old tradition of having a chili cook-off with all of the chili being used to feed volunteers. Bring your grandmothers best recipe or your own best effort. There will be a $50.00 cash prize for the winner and a great sense of community participation by all. Steven Rumsey started donating the use of these huge garbage cans some 15 years ago. 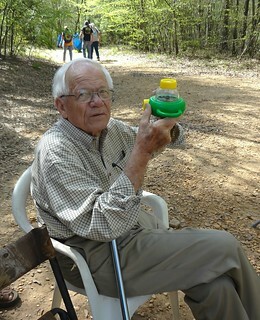 Picking up the vast amount of litter would not be possible without someone to take it away. 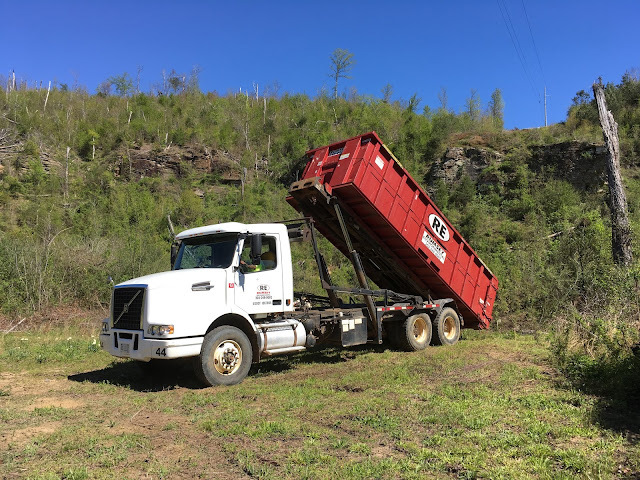 For that, I'd like to offer a personal as well as an organizational thank you to Steven Rumsey and the company he started, Rumsey Environmental Services. In the event of a rain-out, we will try for the following week. We'll keep you posted. 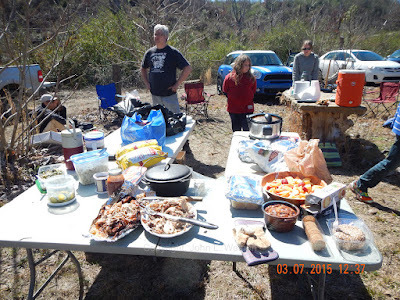 Welcome to the Friends of Hurricane Creek website- everyone is welcome. Over the years the creek has seen some serious abuse. 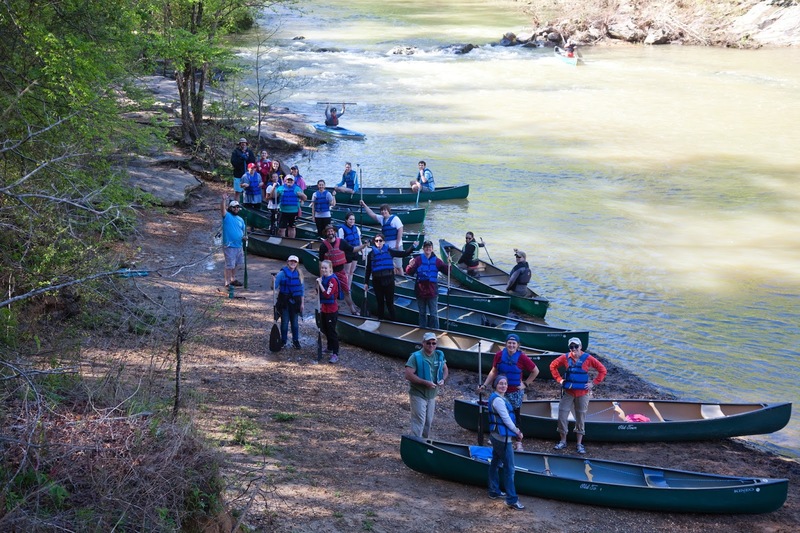 It's time for the Friends of Hurricane Creek annual creek cleanup. 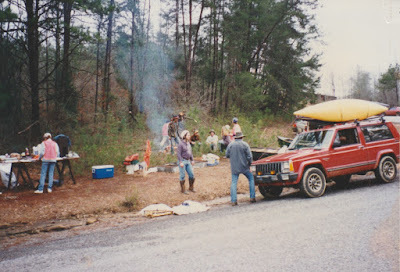 This year on April 08th we celebrate 24 years of friendship, networking, good fellowship, and the fun of cleaning up the creek for future generations to enjoy. 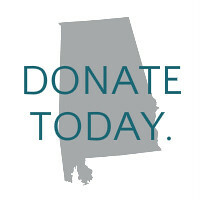 Please consider making it a day for your family to come visit with us. Here's where we will gather at 08:30 and depart from there. It gets better every year! Due to the efforts of Friends of Hurricane Creek and the thousands of citizens who have supported us over the years it is much better now. 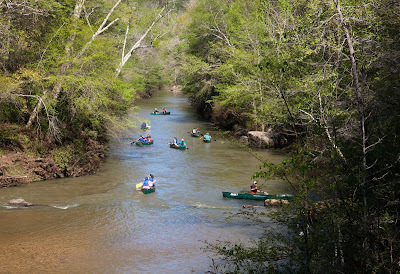 We must remain vigilant to keep it clean so please consider visiting us on April 08, 2017 for the 24th annual Hurricane Creek Cleanup. 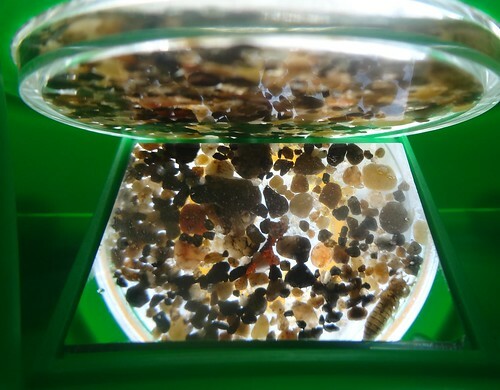 With the assistance of a special viewer, you can see a magnified version of benthic macroinvertebrates found at Hurricane Creek. Can you tell the critter from the pebbles? 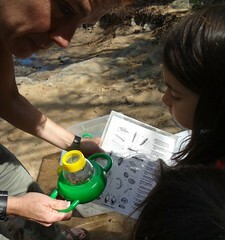 At this year's Friends of Hurricane Creek Annual Cleanup, children conducted a stream survey along Hurricane Creek Park for local benthic macroinvertebrates. 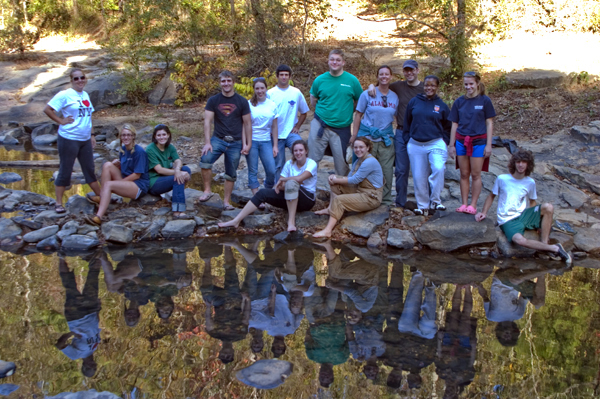 They learned how to identify microorganisms and read data about the stream's health by the presence or absence of specific species. underwater life of Hurricane Creek. 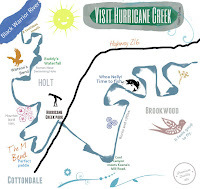 Explore our website for more information on how to join Friends of Hurricane Creek or support your Hurricane Creekkeeper. For more information about events, sightings, and daily life at Hurricane Creek, join our Facebook Group or "Like" or Facebook Page. FOHC is a nonprofit, and our Creekkeeper's work cannot continue without your support. Thank you. on your mobile phone or Android.